Hannum 23. Edition 100. Signed, titled and numbered 50 21/100 in pencil. Image size 8 7/8 x 6 inches (225 x 152 mm); sheet size 11 3/8 x 8 1/2 inches (289 x 216 mm). 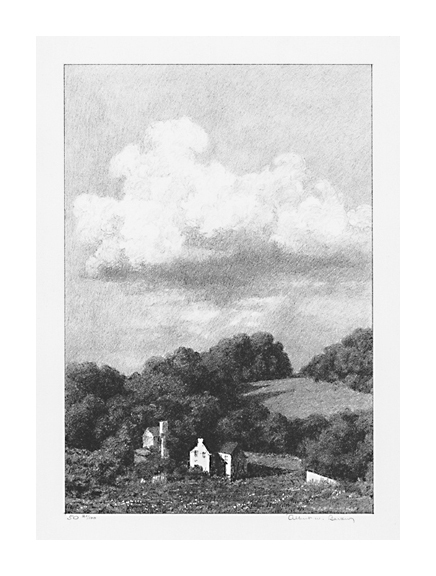 A fine impression, on cream wove paper, with full margins (1 1/8 to 1 1/4 inches), in excellent condition. 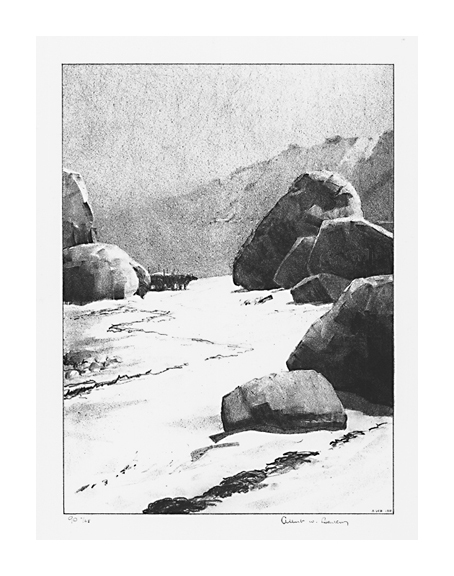 The Boulder Wall --1931, Lithograph. Edition 150. Signed and numbered 76-150 in pencil. Initialed and dated in the stone, lower right. Titled in pencil in the lower left margin. Image size 13 1/2 x 9 3/16 inches (343 x 233 mm); sheet size 16 1/2 x 12 3/8 inches (419 x 308 mm). A fine, rich impression, on cream wove paper, with full margins (1 3/8 to 1 5/8 inches), in excellent condition. Hannum 30. Edition 65. Signed and numbered 90 -/65 in pencil. Initialed and dated in the stone, lower right. Titled and numbered 90 in the stone, lower left margin (the number refers to the stone number). Image size 9 15/16 x 7 3/16 inches (252 x 183 mm); sheet size 15 7/8 x 11 1/2 inches (403 x 292 mm). 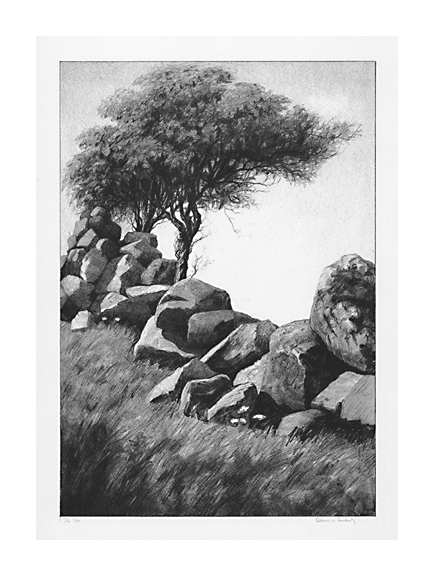 A fine impression, on cream wove paper, with full margins (2 1/16 to 3 5/8 inches). Minor scattered foxing in the margins, not affecting the image, otherwise in excellent condition. Illustrated in Albert Winslow Barker, A Visual Memoir, Brandywine River Museum, PA, 1993.